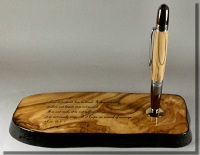 A showcase of items I have produced. Clicking on any image will bring up a larger image and description, moving your mouse pointer off the expanded image will collapse it. Some items may have prices indicated. These are things I have that I am willing to sell although if the right person comes along I am just as likely to give it to them. If you have to ask for it you are obviously not the right person. 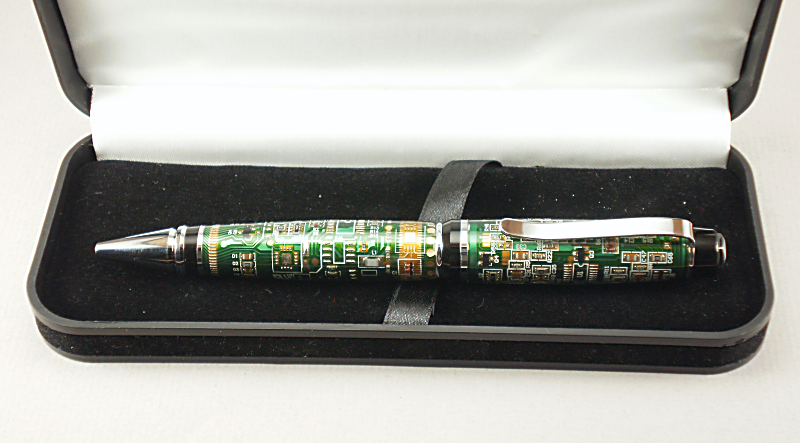 No animals were harmed in the making of this pen. Elk, deer and moose lose their antlers every year and grow new ones. Since it takes a lot of energy to grow antler the size of the antler is an indication of the general health of the animal. When engraved with names and dates this pen would make an excellent wedding pen. 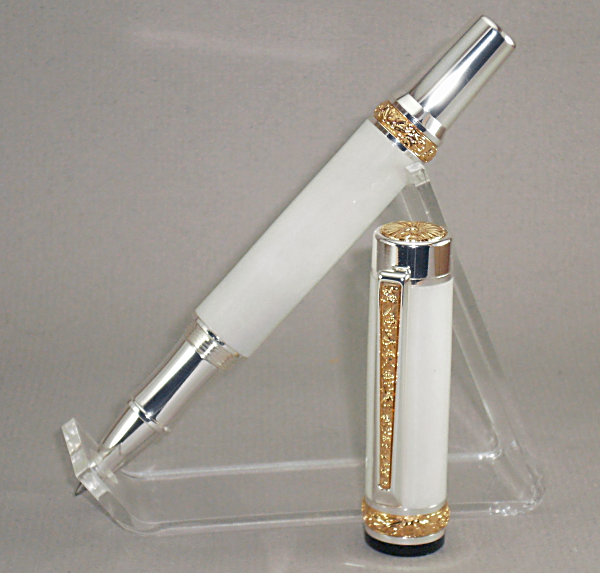 A Pen produced for a friend that was getting married. The pen and stand are both made from Olive Wood. A Pen produced using Canadian Postage stamps cast in clear acrylic. One for the electronics buff. A printed circuit board cast in clear acrylic. 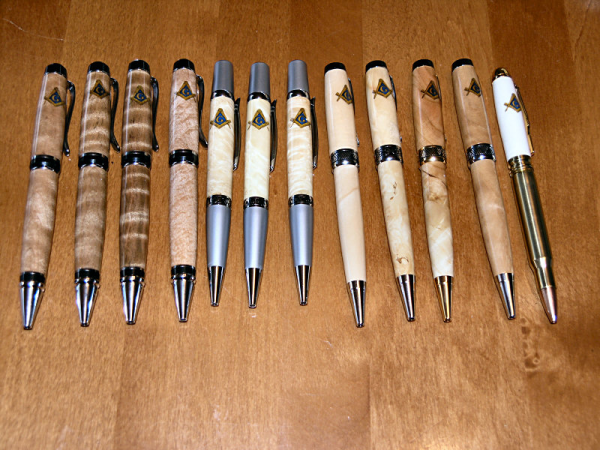 A group of pens for my wife's cousin. He intends them as gifts for others in his lodge and members of a lodge in the Carribean he will be visiting. 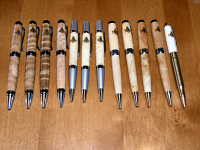 The one with the 30-06 cartridge is for his wifes uncle who is also a hunter. 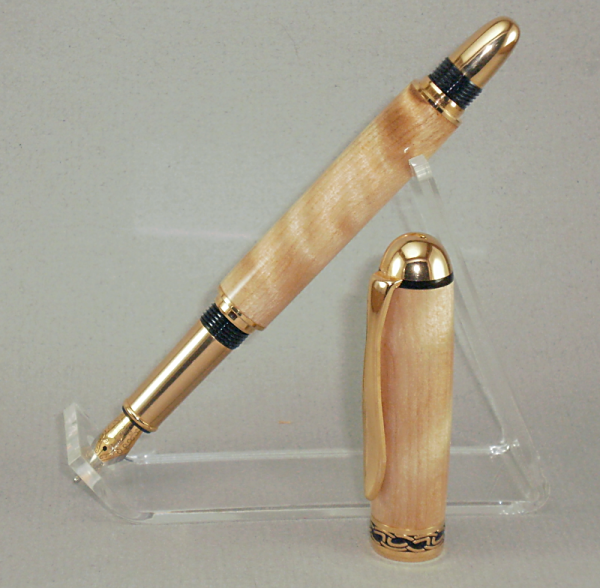 The birch used in constructing this pen was harvested locally. The wood was taken from the crotch section of a branch where 2 or more branches come together. 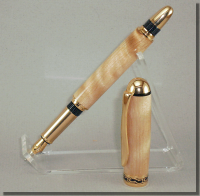 Featuring Titanium Gold plated fittings and a long lasting high gloss finish it can be yours. It comes supplied with 2 ink cartridges and an ink pump for those that prefer bottled ink. 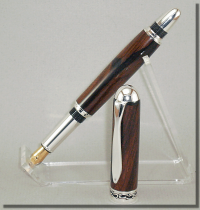 Ziricote is a rich looking chocolate brown to black wood. It is found in parts of Central and South America. 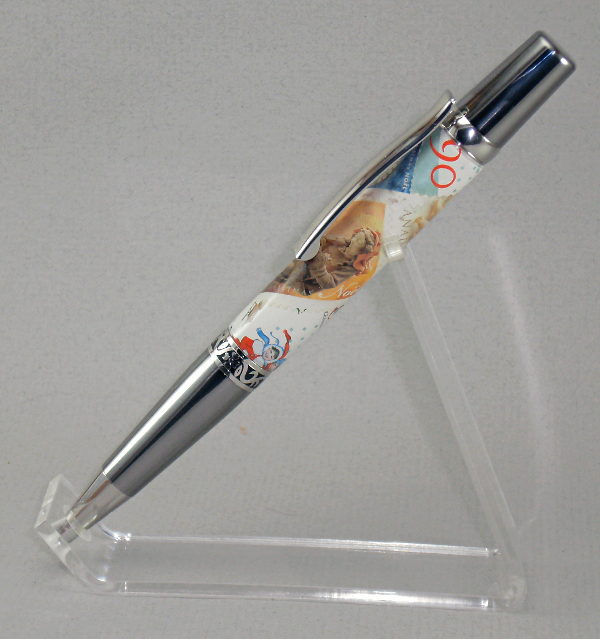 The fittings on this pen are plated in Stirling Silver and is supplied with 2 ink cartridges and an ink pump for those who wish to use bottled ink. 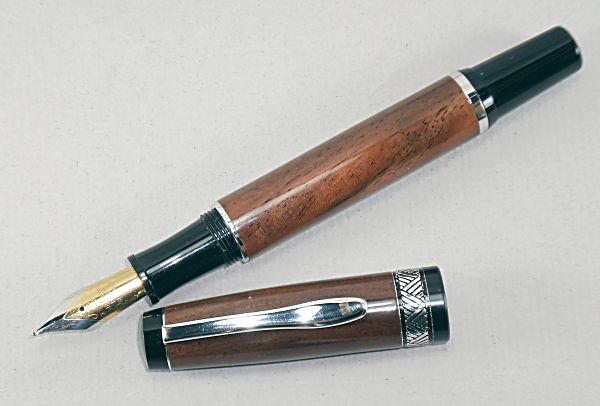 The walnut used in constructing this pen was harvested locally. 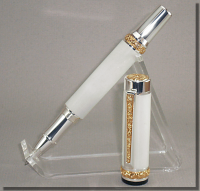 Featuring Platinum plated fittings and a long lasting high gloss finish it can be yours. It comes supplied with 2 ink cartridges and an ink pump for those that prefer bottled ink.